I'm doing something different for our clubs this month! A newly designed newsletter for you! Please let me know what you think--yay or nay? If your club hasn't renewed its membership for 2016, please send these along as soon as you can, especially for those clubs that hold shows! June 1 is the deadline; after that date any club that doesn't renew will be taken off our website. We are trying to get the word out to everyone that if someone has renewed at the $40 Associate membership level, that does not give that person competition privileges and reduced registry fees. This is especially important given that show season is starting! Please pass on the word to your members! Are You Competing This Show Season? Please note this membership level will not give you discounts to the registry and you cannot compete at Morgan shows without paying an additional non-member fee based on USEF's new rule change. To avoid paying unnecessary fees, upgrade to a $70 Standard member now! You will get all the wonderful benefits mentioned above and save time and money before show season starts! The selection committee held numerous meetings to thoroughly consider the requests and we applaud everyone's hard work on their submission(s). * Morgan Stock Horse Association to conduct ad campaign in Western Horseman magazine with circulation of more than 160,000 readers per month. More than $70,000 was earned at the 2016 AMHA/WMF Online Stallion Service Auction. This year's auction, which was entirely online, earned nearly $20,000 more than the 2015 auction! The net income following expenses from this auction go to breed promotion and will be distributed to the World Morgan Futurity, AMHA regional shows, the AMHA Show Grant Program, and AMHA's Marketing and Promotion. The overall top-winning bid went to Arcola Farm for Dragonsmeade Axios at $4,875. Arcola also was the high bidder of Futurity French Command, who rounded out the top four bids at $3,275. Iann Fu Longenecker bid $4,525 for Jake Ryan and Mary Nelson bid $3,525 for Graycliff Tony GCH. To read a complete list of horses and the winning bids and bidder, please click here. Get Ready for Youth Camps! If you're running a youth camp at your barn this summer, we're here to help! You can download the first two Horsemastership workbooks on our website for FREE! These wonderful activity books teach youth about anatomy of the horse, tack, grooming, vet care, equitation and so much more. You can print out as many as you need for youth to use during your camps, youth club and 4-H meetings. Youth will build their horsemanship skills while you help to promote our great breed - what could be better? If a youth is an AMHA member or becomes a member and completes the workbooks, you can submit a Report Form to AMHA so the youth are rewarded with a certificate, badge, and gift certificate to the AMHA Store. Contact Katie Hodges for any questions at Katie@morganhorse.com or (802) 985-4944 ext. 401. AMHA, in tandem with Carriage House Promotions, is offering an expanded Gift Catalog for every aspect of your life-and your Morgan's! From trailer hitch to license plate covers, to bags and totes, glassware and gifts, men's, ladies, and youth apparel, even horse blankets and coolers, this whole new line of gift offerings is carefully created with our Morgan owners in mind. Go to www.amhamarketplace.com, AMHA's official online store, to check out this year's offerings and to order today or call Carriage House Promotions toll free, 1-800-227-9451. You can see all there is to offer in the Gift Catalog by clicking here. Congratulations to These Morgan Champions! What do Bonnie Lee Future Flair, Faith's First Impression, Futurity Diamond Rio, UVM Martin St Louis, Tracemark Top Shelf, MLB Capo Di Capo, and Holiday's Bonita Fe have in common? They are the latest champion enrollees in AMHA's Champion Title Program! 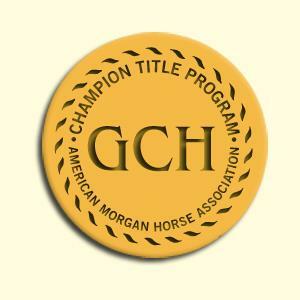 Established in 2012, AMHA's Champion Title Program has more than 250 champion horses enrolled. Have you heard about AMHA's Champion Title program, but didn't know how it works! Here is what you need to know: To become a Champion, a horse must earn 15 points at any USEF rated all Morgan show or in Morgan classes sanctioned by USEF; to become a Grand Champion, a horse must earn 30 points. Other details apply. The enrollment fee is $75 and $15 for each year of competition points are earned with the maximum of $250 for retroactive enrollment. Start your show season off right with a new title for your Morgan! To find out if your horse has the points necessary to be a Grand Champion, call Chris Koliander at (802) 985-4944 or email chris@morganhorse.com. 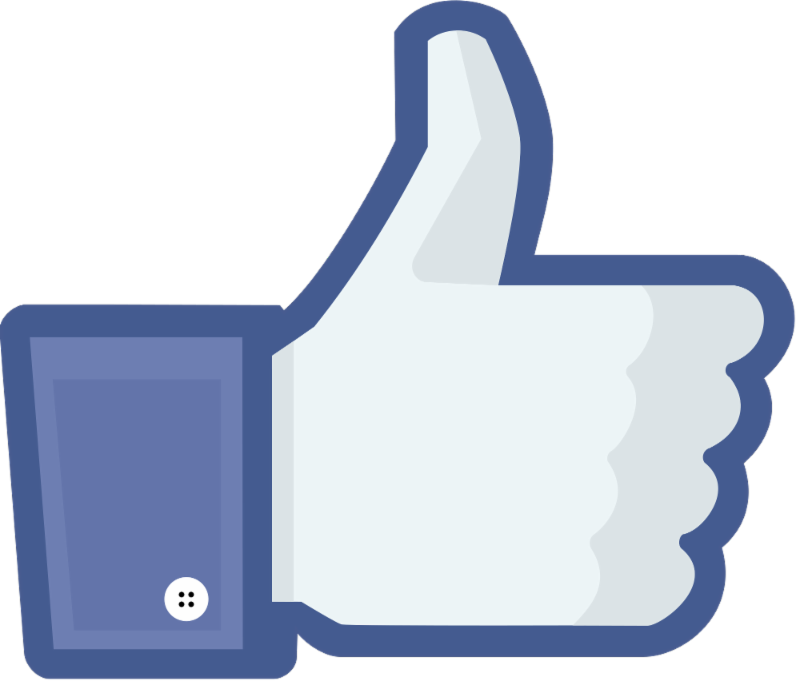 Next time you are on Facebook, check out AMHA's page, "Sharing Carrots." This page has interesting equine news, updates from the Association and Grand National, and any other interesting tidbits we want to pass along to you! Go to Sharing Carrots and "like" us! Do You Need Your Membership Card Today? If you renewed your AMHA membership recently, your card is on its way. But what happens if you lose or misplace your card during the year? Now it's no problem! Just follow these handy instructions and you can print a replacement card at home! 1. 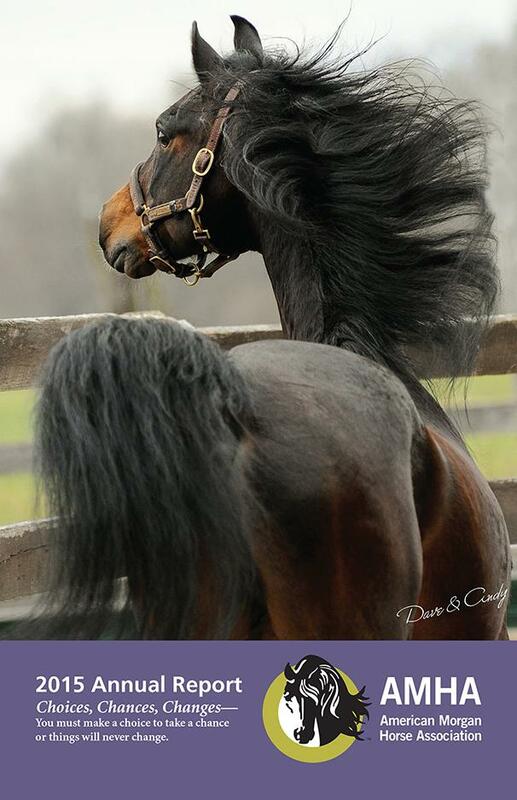 On the homepage, www.morganhorse.com, look to the right-hand corner and click "Log-In." 2. Log in with the username and password you created. If you have never logged in before, please follow the instructions on how to log in on that page. 3. Once you are logged in, you will see a list of buttons to the right. Click "Your Account." 4. You will now be in your account. On the left-hand side, click the bar that says, "Account Info." Once in, just click on the line, "Replace Your Membership Card," and print! It's that easy! Please note, if you renew your membership online, before exiting, you can print out your member card right then! If you log out, you will have to wait 24 in order for the money to clear. For more information or help with this process, contact the AMHA Membership Department at (802) 985-4944. Do you wake up in the middle of the night thinking about the Morgans you bred? Perhaps you cannot remember that one registered name? AMHA listened and we heard you! A breeder history and ownership history lookup has been added to AMHA's Online Registry Database. You can search by owner or breeder name, a partial name, or by city, state, zip code or country. Horse ID's in the results are hot links to the horse database to help you obtain information speedily. Please remember that many owners and breeders own horses in multiple accounts (for instance: singly or jointly or in a farm or business account), so you may have to search in different ways to obtain complete information. Access to the AMHA Online Registry database is free for Standard, Premium, Life, and youth members. Associate members and non-members can purchase subscriptions to this outstanding information source. Log on the database today! http://www.morganhorse.com/registry/online. Promoting the Morgan? AMHA is Here to Help! Do you know that AMHA is here to help with your Morgan promotional needs? Whether you are having an open barn, fun trail ride, or a horse show, we have the materials needed so you can promote your event to your community! 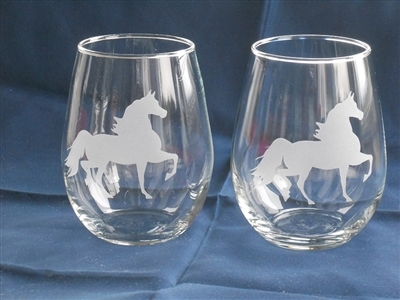 Go to http://www.morganhorse.com/about/forms/ to see a sample press release and advertisement and to see what we have to offer in the way of promotional items to order! As always, we are here to help! If you have any questions or need guidance, contact AMHA Communications Specialist Christina Koliander at chris@morganhorse.com or call (802) 985-4944 ext. 402. Will you be showing your Morgan at open shows this season? 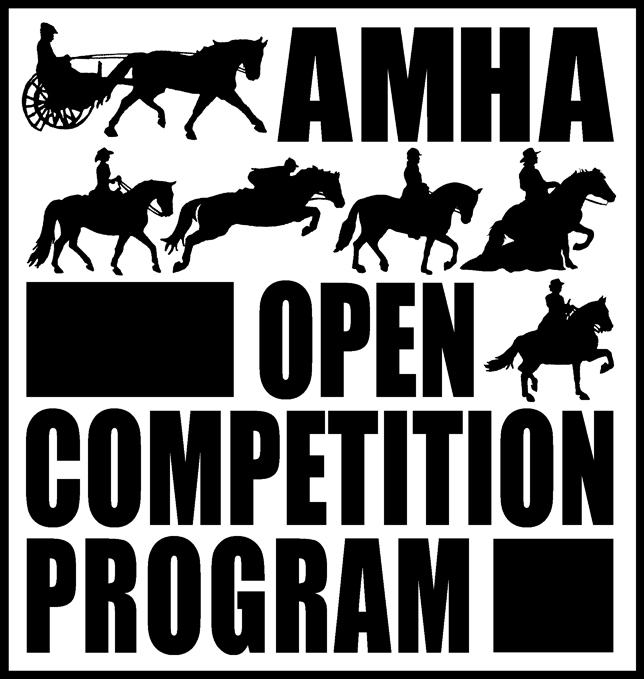 Take that competitive edge one step further by taking part in AMHA's Open Competition Program! There is a division for everyone, and for just $50 a year for enrollment or $40 for an annual renewal, you can keep track of points and earn year-end awards! Or you can pay a one-time fee of $200 for the lifetime of your horse. Don't let your winning accomplishments in the open arena go unnoticed by AMHA! Call Katie Hodges at (802) 985-4944 ext. 401 or email katie@morganhorse.com for more information or to sign up. At the March 16, 2016 AMHA Board of Directors meeting, the Registry Committee made a recommendation to offer assistance to adopters/rescuers of horse from the Hoskins' dispersal by reducing registry fees. Effective March 16, 2016, for a six-month period, any qualified* AMHA member who acquired a horse from the Hoskins' dispersal will be charged a $50 all-inclusive fee per horse for any registry procedure(s) necessary. *Note: A qualified AMHA member must hold a 2016 standard, premium, life, youth, or youth life level membership. 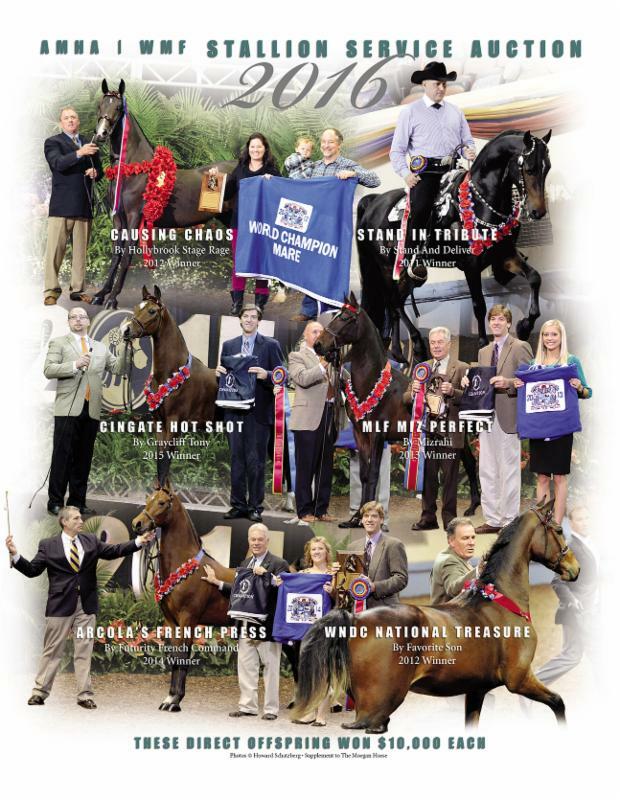 If you were unable to attend the Meeting of AMHA Members on February 11, the 2015 Annual Report can be downloaded at http://www.morganhorse.com/about/who-we-are/supporting-documents. Also, the 2015 Financial Statements and Auditor's Report will soon be available on the "Members Only" side of the website.